Middle Fork River Expeditions (MFRE) is offering Drift Boat Fly Fishing on its Middle Fork of the Salmon River trips in Idaho. Middle Fork River Expeditions (MFRE) bought 16 Foot Hog Island McKenzie Drift Boats. MFRE is the first outfitter on the Middle Fork of the Salmon River to provide the Hog Island experience, with huge padded fly fishing casting braces and a ton more room in the boat to move around. MFRE has more river craft options than any outfitter in the world including Mckenzie Drift Boats, Oar Boats, Wood Dories, Paddle Rafts, Inflatable Kayaks and Inflatable Stand Up Paddle (ISUP) boards. The best part is you can choose any craft you want. 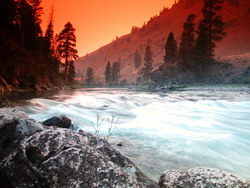 Middle Fork River Expeditions (http://www.idahorivers.com) is offering Drift Boat Fly Fishing on its Middle Fork of the Salmon River trips in Idaho. Middle Fork River Expeditions (MFRE) bought 16 Foot Hog Island McKenzie Drift Boats. MFRE is the first outfitter on the Middle Fork of the Salmon River to provide the Hog Island experience, with huge padded fly fishing casting braces and a ton more room in the boat to move around. Hog Island roto-molds HDPE plastic in a process that makes them the most durable drift boat on the river. One can shoot them with a shotgun or chainsaw them in half and they still float on the water. MFRE now has more options of river craft than anyone in the world operating rafting trips. River craft options are Drift Boats, Oar Boats, Wood Dories, Paddle Rafts, Inflatable Kayaks and Inflatable Stand Up Paddle (ISUP) boards. Middle Fork River Expeditions, licensed and bonded outfitter, has run safe and well-managed river trips on the Middle Fork of the Salmon River in Idaho for 30 years. Trips are 4 and 6 days of exciting river rafting, wilderness camping, fine fishing, and adventure travel. Our river guides are seasoned professionals, licensed by the state of Idaho and First Aid Certified. They are expert river runners and fishermen, magnificent cooks, great storytellers, and knowledgeable, helpful outdoorsmen. Check out our website for photos of our River Craft Options. Join Middle Fork River Expeditions for a magical wilderness river vacation fishing from these new Hog Island Drift Boats.